Although the concept of matched betting has been around for a while, it’s only in the last few years that it’s really caught the imagination of the public. Thanks largely to increasingly fierce competition between the biggest bookmakers, the sheer amount of offers and promotional bets available has made matched betting a viable way to earn a regular second or supplementary income. Matched betting sites have responded to this surge in activity by offering tools and services to aid beginners and stalwarts alike. If you’re going it alone, you’ll need to be super organised. Your spreadsheet skills will need to be top-notch (to keep track of logins, pending bets, profit, balance, etc…). You’ll also have to dedicate a good chunk of time to scouring bookmakers websites for their latest introductory and reload offers. It can be done, but it’s important to remember that the more time you spend on administration and manual tasks (e.g. working out your expected returns without a matched betting calculator), the less time you’ll have to actually place bets and maximise your profit. We’ve all got busy lives, so anything that can help us fit matched betting around our kids, our jobs and our social commitments has got to be worth looking at, right? That’s where matched betting sites and services come in. We’ve put together our top five reasons (in no particular order) for using one – so take a look below and see how you could start making money online quickly and easily with the help of a matched betting service. Never underestimate this major feature. Matched betting services employ dedicated systems and teams to bring together all the latest free introductory offers (for new customers) and reload offers (for existing customers) in one place – your dashboard. Because your account is held securely online, you can access this dashboard anywhere. At home when you get five minutes peace – or out and about on your mobile. Basically anywhere you can get an internet/mobile connection. This makes it really easy to keep track of your progress. And knowing which bets you need to place is (we think) your number one priority when matched betting – it’s the key to making as much profit as possible. Your dashboard will help you do that. Set profit goals – so you can easily see your current progress and what you want to achieve each month. This way, you can easily work out the amount of time you want (and can) dedicate to matched betting each month. At-a-glance look at the bookies you are currently registered with and any pending sign-up steps – if you still need to complete steps to register with a bookmaker or betting exchange, your dashboard will let you know what you need to do. This is vital as there may be very specific requirements stipulated by a bookie or betting exchange to enable you to qualify for a free bet. Having everything in one place can help avoid costly mistakes (which could see you missing out on an offer entirely). Constant access to the latest offers – these will be automatically added to the dashboard, so you’ll never miss a new opportunity to make extra, tax-free profit. Integrated odds checking software – there are separate odds checking tools out there, but matched betting services often have integrated software so you have everything you need in one place. Tracking Plus, the system we use at The Sure Bettor, for instance, allows you to keep your matched betting in one place – open bets, profit tracking, matched betting history – all of it accessible in one handy tool. To make it even easier to visualise your goals, all your data can be viewed in a range of customisable graphs and tables. All these extra features contribute to another important part of matched betting – freeing up time so you can decide how to spend your profit – after all, that’s why you’re here, right? Maths doesn’t have to be your strong suit. And get this – some people who use matched betting to make money online aren’t even into football, horse racing or any of the other potential sports/markets available to you. For this reason, premium services usually develop an intuitive matched betting calculator to help you quickly and easily see the required stake to either minimise losses or maximise profits. So it doesn’t matter if you don’t have an intimate knowledge of ‘Expected Goals’ in the Premier League, an insight into Coolmore Stud’s breeding operation or years of experience with betting markets, a matched betting calculator does all the heavy lifting for you. It all comes back to time. The more of it you have – the more profit you can make. 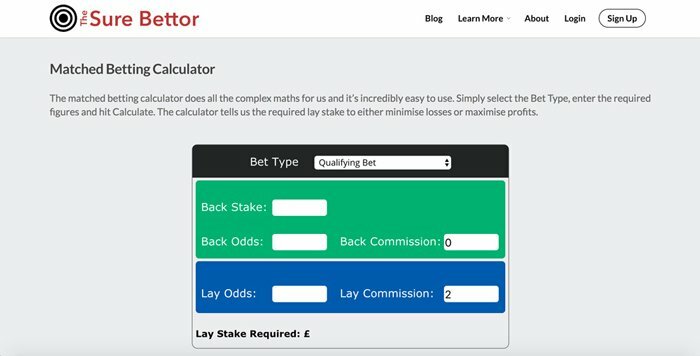 The Sure Bettor’s matched betting calculator is free for anyone to use. So take a look for yourself at how simple we’ve made it. Unlike other matched betting calculators, ours lets you change the back commission – essential when placing a back bet at a betting exchange. Being able to instantly see the outcome of either a bookie (back bet) win or an exchange (lay bet) win is just one of the many innovations we strive for to make the matched betting process even easier for you. We aren’t afraid to admit it – there is a learning curve to matched betting. And having a working knowledge of bookmakers, betting exchanges and gambling markets will certainly give you a head start. But what about people who are completely new to this great technique? For anyone new to matched betting, we’d go so far as to say that using a matched betting site is a must. Not only will you get access to a host of integrated tools to make your life much easier, crucially, you’ll have a team of experts at your fingertips. Having dedicated email support on tap, as well as a thriving community of ardent matched bettors, means that the answer to your matched betting questions is never far away. Helping you navigate those initial offers, showing you how to actually place bets, explaining the difference between a back and a lay bet – all the things that seasoned matched bettors might take for granted. And if you’re still manually managing all your bookie/betting exchange accounts – what happens if you run into a problem? Or you want to learn more about ‘mug’ bets? Or you want to know the best way to maximise your profit? Having the ability to instantly contact an expert is a feature not to overlook and can take the stress out of matched betting – especially for those newer to the technique. In fact, praise for our support team is probably the number one comment we receive from our premium members! Here at The Sure Bettor, getting you up and running (and consequently, making money) is our number one priority. Everyone’s circumstances are different. Our members include students who want to earn a bit of extra cash while they study, mums and dads who want to supplement their household income with tax-free profit, and serious disciples of matched betting who dedicate as much time as possible to the technique (and often earn £1000+ per month). If you’re new to the world of matched betting, having access to a range of tutorials compiled by experts is ideal – allowing you to supplement your knowledge as you grow in confidence. Remember, matched betting is guaranteed profit – this isn’t a game of chance where the odds are stacked in the bookmakers favour. For that reason, laying out the most efficient way to increase the money you make via a series of written or video tutorials can help you achieve your profit goals more quickly. Matched betting (and the betting industry in general) doesn’t stand still. Over the last few years we’ve seen an explosion in terms of enticing offers from bookies and betting exchanges for new and existing customers. This has fuelled greater interest in match betting. As a result, matched betting sites have responded by rolling out new tools, features and innovations to help their members maximise profit. From matched betting calculators, to customisable dashboards to on-tap support services – everything is geared up to reduce the time you spend on the more ‘administrative’ aspects of matched betting. Here at The Sure Bettor, we’re committed to providing constant innovation. We’ve recently introduced Tracking Plus – the best way to check odds for your matched bets – and we have plenty more amazing tools and software in the pipeline. Why choose Matched Betting sites and services? Whether you simply want to dip your toe into matched betting, or completely immerse yourself in this risk free way to make money online, utilising the services of matched betting sites will give you the best chance of making as much money as possible – automating many of the more tedious aspects of matched betting. Of course, you could still go it alone – use a variety of disparate tools to aid you in your matched betting, but remember – the guaranteed profit you’ll make during our free trial is enough to cover your first couple of months premium membership. The Sure Bettor is one of the fastest growing matched betting communities in the UK. We’re dedicated to providing an industry-leading experience for our members. Our support & help services are industry-leading. Our (human) experts are always on hand to offer further guidance. Take our free 14 day trial today and start making guaranteed profit, tax-free.